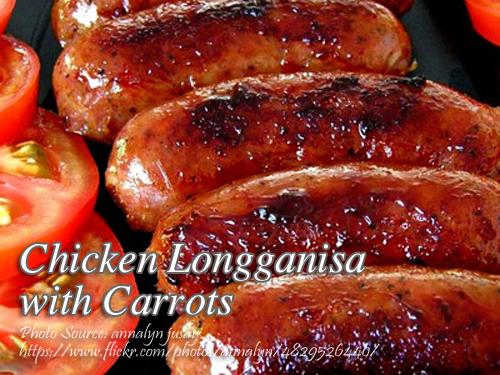 Chicken longganisa with carrots is a healthy alternative to pork or beef longganisa because it is low in fat and has vegetable extenders such as carrots and turnips. So why should you make this recipe since you can buy ready to cook chicken longganisa? My answer is, as I’ve mentioned above, this is a healthy alternative since you will use chicken breast and has vegetables and with no preservatives. It is also cheaper when you make it yourself and you can also sell it since this is a unique chicken longganisa. To make this chicken longganisa; In a bowl mix the chicken breast, carrots, turnips, garlic, sugar, salt, pepper, vinegar, soy sauce and hot sauce. Refrigerate overnight. Then fill the casing with the meat mixture to desired length then tie ends with strings. Hang in a ventilated place for a few hours then freeze to store the chicken longganisa. To see the complete recipe with list of ingredients in exact measurments, continue reading. In a bowl mix the chicken breast, carrots, turnips, garlic, sugar, salt, pepper, vinegar, soy sauce and hot sauce. Refrigerate overnight. Then fill the casing with the meat mixture to desired length then tie ends with strings. Hang in a ventilated place for a few hours then freeze to store the chicken longganisa. To cook it, in a deep skillet, put the longganisa and pour half cup of water and 2 Tbsp. cooking oil. Prick each sausages with a fork to prevent the longganisa from bursting. Cook it until the liquid dries up and starts to sizzle. Then fry the longganiza until golden brown.